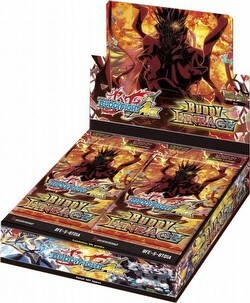 Every Future Card Buddyfight: Buddy Lineage booster box is guaranteed to contain a BR, SP, or bonus SECRET pack! As usual in Alternative Boosters, some cards are getting the RRR-treatment. This means they get a hot-stamp and texture emboss, giving them the luxurious feel that card fans adore! Buddy Lineage features new and improved forms for many popular monsters from the past. All worlds are featured in this set. There are 127 different cards in the set (1 CR, 5 BR, 3 SP, 25 SECRET, 8 RRR, 15 RR, 29 R, and 41 C). There are 11 reissued cards. Each booster box includes 30 packs. Each pack contains 5 cards, including one card that is rare or better. Parallel foils of commons and rares are randomly inserted in packs.